The Blood Red Fire Shrimp prefers a habitat providing it with a cave or overhang where the lighting is not too intense. While it will tolerate its mate, others of its own kind will be chased away or harassed. It is generally peaceful with most other organisms in the reef system unless they impinge on its territory. As a "cleaner shrimp," it will set up cleaning stations and remove dead tissue and parasites from fish that present themselves. Like other invertebrates, the Blood Red Fire Shrimp is intolerant of copper-based medications, high nitrate levels, and fluctuating water parameters. It also requires the drip-acclimation process when first introduced to your system. Also, proper iodine supplementation is necessary to promote molting and growth. 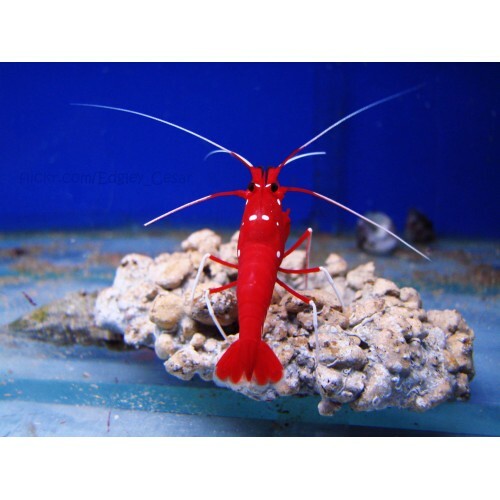 To supplement their diet, feed Blood Red Fire Shrimp Shrimp freeze dried, frozen, and flake foods.